With a population nearing 20,000, the City of Punta Gorda is home to true natives that have lived here for many generations dating back to the late 1800s, and those that came here and made it their permanent home and left the cold weather behind, as well as those that have chosen it to be their home part of the year. Punta Gorda consists of approximately 100 square miles of land and man-made canals that provide boating access to Charlotte Harbor on the east side, making it an absolute boater’s dream. Charlotte Harbor covers approximately 270 square miles. It has been said that Charlotte Harbor waters had been traveled by the likes of Ponce de Leon, who they say was one of our early first settlers, and stories are told of notorious Pirates Jose Gaspar and Jean LaFitte coming to port in the area with their ships. If you love fishing, we have a large variety of fish species to try for throughout the year. We also have acreage properties if you have horses or just want to have the extra land around you. After Hurricane Charley stopped by on Friday the 13th of August 2004 and wreaked havoc on the area, the City of Punta Gorda has come back with the help of the hands and spirit of the community and now is a place to enjoy living and visiting year round. It is an even more vibrant, beautiful, and active community as you will see when you come to the area. There are many things to do here that allow you to continue to be active all year long – biking, walking, running, golfing, tennis, swimming, fishing and boating. Or, spend the day shopping and touring our Fishermen’s Village and downtown Punta Gorda’s boutique shoppes and art galleries. Who has time to get older? Our lifestyle will provide you a quality of life you can only dream of right now. Make it happen! The City of Punta Gorda competed in 2013 for Rand McNally Best of the Road’s contest for America’s Best Small Town and became a very strong finalist in the vote for "Most Beautiful." Click here to see why we think Punta Gorda is the Most Beautiful Small Town in America! It had also been named in 2013 as Best Place to Retire in the country by Where to Retire Magazine. And, in the past the area’s been named one of the best places to sail by SAIL Magazine, and one of the best places to golf by Golf Digest Magazine. Kiplinger Magazine's February 2015 edition placed Punta Gorda in its top 10 list out of 200 metropolitan areas in the country as one of the Most Affordable Places to Retire to. I can keep going, but you’ll see for yourself when you book your trip here. Check Allegiant Airlines’ flight schedule , as you may be near a smaller hub airport that flies right into Punta Gorda’s Airport. As a saying goes that I’ve heard, Come for a Visit, Stay for a Lifetime. 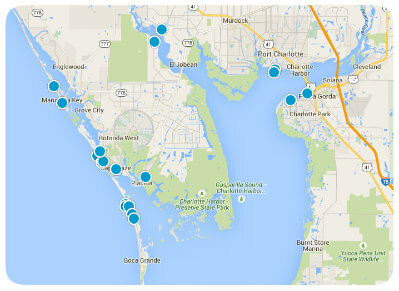 Start your search for Punta Gorda real estate here! Burnt Store Gulf Villas SubDv.